Explanation: Ganymede's surface is slowly being pulled apart. This photo of Ganymede was released earlier today by the Galileo team at NASA. The Galileo Spacecraft arrived at Jupiter in December 1995. 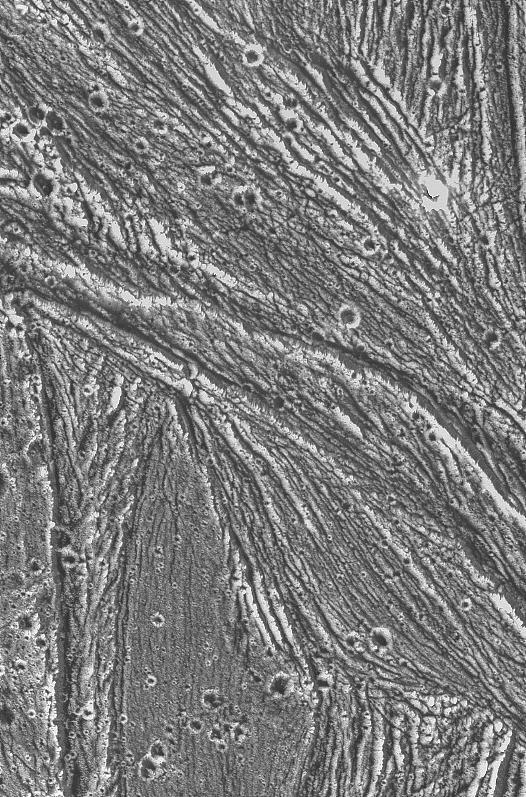 In late June, the spacecraft passed within 10,000 kilometers of Ganymede's icy surface, and took pictures showing complex surface details for the first time. The line-like features in this photo are sunlit ridges rising above Ganymede's ice-plains. The circular features are impact craters. Ganymede is the largest moon of Jupiter and hence the largest of the four Galilean satellites: Io, Europa, Ganymede, and Callisto.